Local garage punks The Nods talk about the evolution of Salt Lake's music scene. Clockwise from top left: Rocky Maldonado, Joey Mayes, Jeremy Devine and Travis Michael of The Nods. Much like the barren valley early pioneers encountered when they trundled down the west side of the Wasatch Mountains, Utah's local music scene wasn't much to look at around the turn of the millenium. Fast-forward nearly two decades, and you'll find a fertile and verdant scene has taken root and continues to spread across the Wasatch Front. Although The Nods see themselves as a small group of local music enthusiasts within a larger collective of bands, promoters and venues, their contribution to Utah's sonic reforestation shouldn't be overlooked. The Nods officially came to be in 2013, but its members were deeply involved in Utah's music scene long before then. In 2001, guitarist Joey Mayes moved to Utah from Memphis, and he recalls the shift in musical culture as a bit of a shock. "Memphis is hopping with music all the time, so when I moved here, it was completely the opposite," he says. "But things have changed quite a bit. There is so much happening all over the valley right now, and it's very exciting." While Mayes was attending Utah Valley University, he became involved in Provo's developing music culture, playing in a number of Utah County bands before his stint in Broken Spells. After he moved to Salt Lake City in 2011, it wasn't long before he started to get involved with local performances downtown. As he drifted from show to show, Mayes eventually discovered a kindred spirit in Nods vocalist Zach "Rocky" Maldonado, who happened to be attending a lot of the same shows. "It was me and Rocky and a different drummer, and we would just come to my house and mess around in my basement," he says. "I'm more into garage punk music and '60s soul and pop; Rocky was more into early psychedelic music and the whole Manchester scene. We didn't have a lot of overlap, but we started making our music from there." As The Nods gained traction, they met bassist Travis Michael and drummer Jeremy Devine, completing their current lineup. "We've all hung out at the same shows for a long time," Mayes says. "Eventually we just came together at the right time to play music together." The addition of Michael and Devine helped The Nods' signature take on garage rock coalesce into what it is now. "I knew Jeremy's style and I thought it was really cool," Michael says. "I came over and just messed around one day, and they [Mayes and Maldonado] said I was in instantly." "With the addition of Travis, our sound got a little harder and rougher," Mayes adds. The Nods released their first album, Ariadne's Thread, via Bandcamp in March 2015. It's a barreling force to be reckoned with, channeling shards of early Joy Division into an unrelenting crescendo of pent-up aggression. "We do all the recording ourselves," Mayes says, "We recorded Ariadne's Thread at my house,"—which the band lovingly refers to as The Nodhole. "Rocky also has a studio. We did our 7-inch and are working on an LP with Hot Wax Records in the U.K." The band is planning a wide release of the LP this fall. In the meantime, The Nods can be found playing shows as part of Nods Presents, a passion project helping up-and-coming local artists get some much needed exposure. "I scour Bandcamp all the time looking for local bands. I'm on the hunt," Mayes says. The lineup of their upcoming show includes female punk rockers Nasty Nasty—who popped up on The Nods' radar because of their involvement with Utah's Rock Camp for Womyn—and Miami Face Eaters. "We've been given a platform where we can continue to shake it up and mix things around," Mayes says. "Salt Lake is going to be so much fun this summer. We're going to bust it out!" 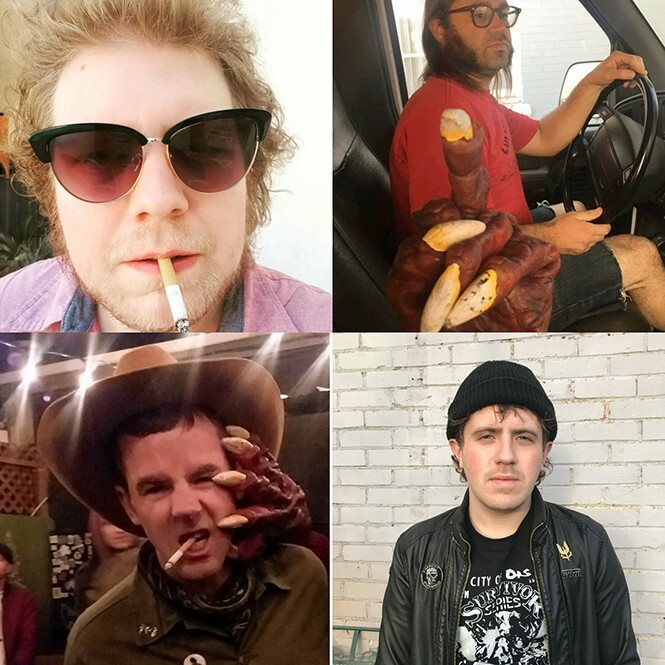 Although The Nods continue to be both stalwart members of Utah's musical ecosystem and new talent headhunters, they are quick to dole out credit to those who have come before them. "There have been a lot of people putting a lot of time and hard work into introducing new acts and new ideas to the kids around here," Mayes says. "We're seeing the fruit of all that labor. Salt Lake is exploding with new music, and we're having a blast."